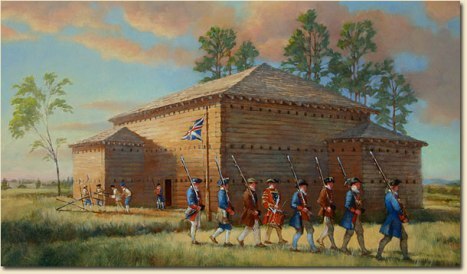 On December 21, 1756, Commissioners Richard Caswell and Francis Brown inspected the recently completed Fort Dobbs. Their report to the assembly of the colony described “A good and Substantial Building” that was 53 feet by 40 feet, with oak pillars supporting the structure, which rose almost 25 feet. Soldiers were able to simultaneously fire up to one hundred muskets from the walls of the fort, making Fort Dobbs an imposing headquarters on the Carolina frontier. Western expansion in North Carolina forced England to protect colonists in the wilderness. To that end, the provincial assembly approved 1,000 pounds in March 1756 for the construction of a defensive fortress. Governor Arthur Dobbs chose a location in present-day Iredell County and charged Col. Hugh Waddell and his frontier company of 50 men with protecting both the fort and colonists’ trading rights with Indians against the encroaching French. It was the only permanent frontier provincial fort in the colony of North Carolina. Fort Dobbs, now one of North Carolina’s 27 state historic sites, is the only one dedicated to the French and Indian War (1754-1763), the North American chapter of the broader Seven Years War between England and France.